Leasing a mobile office container is a great way to handle on-site management. Whether you need a secure location for office equipment and documents, or you’ll use the space to meet with clients, you need to rent from the right storage services company. The ease of a mobile office has a number of benefits. If you think a construction or other outdoor project doesn’t need an on-site office, think again. For the times you need to meet with clients, take calls away from loud noises, or review documents, you’ll want a dry, secure place to do it. Mobile office units can also offer storage space for blueprints, equipment, or other supplies that should be locked away. An office storage combo unit makes for a great on the job office. The units are equipped with a phone line, heating, a/c and power. You can operate your business from the job site comfortably. So you need a office storage container? Here are the six things you need to consider before leasing. Purpose: How will the office and storage space be used? Consider what tasks you’ll complete inside the container to determine different elements like the size, features, and how long you’ll need the unit. The Elvis Service Company team can help you decide on the appropriate unit when you know how you’ll use the space. Size: Office storage containers can come in a variety of sizes, but the most commonly used are 20 and 40-foot containers. If your mobile unit will serve as a office space for multiple people or you need added storage, the larger unit will work best. Time: When you set your lease term for the office storage container, consider any potential delays in your project. Account for holidays when work will stop or unexpected requests from the client that may prolong your original deadline. Location: For the most precise delivery of your unit, know whether the area has a clearing for delivery. You’ll also want to share if the space is level, grass, dirt, or concrete. This information will help your office storage unit rental company make the delivery a smooth transition. Extras: What amenities will you need to make the mobile office storage space productive? If you need desks, shelves or door cages, make those requests known. Maintenance: Will any upkeep of the office storage unit be needed while you’re using the container? Ask your leasing company how challenges are handled in the event something goes wrong. 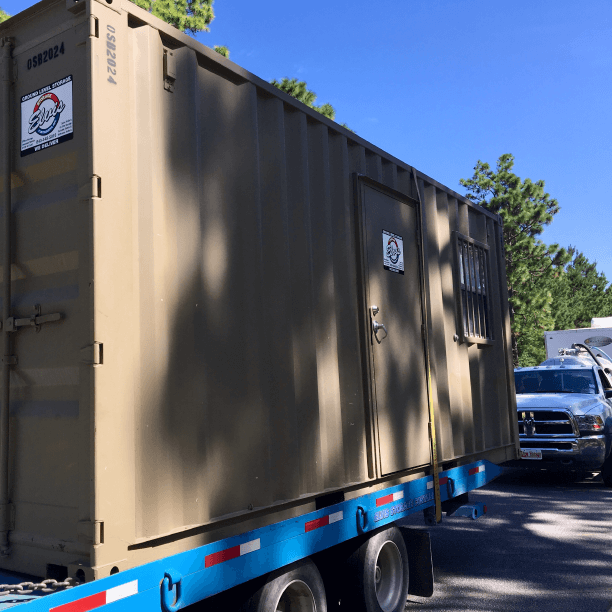 A mobile office storage container is one of the best ways to manage your work site and keep your equipment and paperwork safe from the elements. Speak with the Elvis Service Company team about your project to determine the best size container for your needs.